The 15th season finale of The Voice airs tonight but fans of the singing competition can already mark their calendars for the kick-off of season 16. In addition to The Voice, the peacock network has announced the return dates for World of Dance, Good Girls, and A.P. Bio. Season 16 of The Voice will debut on Monday, February 25th, at 8:00 PM. Season three of World of Dance kicks off with a special airing on Tuesday, February 26th, at 8:00 PM (the program will next air at 8:00 PM on Sunday, March 3rd, in its regular timeslot). Returning for its second year, comedy-drama Good Girls will debut on Sunday, March 3rd, at 10:00 PM. Comedy A.P. Bio, also back for a second season, will launch at 8:30 PM on Thursday, March 7th. · The four-time Emmy Award-winning “The Voice” returns with the strongest vocalists from across the country invited to compete in the blockbuster vocal competition show’s new season. EGOT winner and multi-talented John Legend joins returning superstar coaches Kelly Clarkson, Adam Levine and Blake Shelton for season 16. Carson Daly returns as host. · “The Voice” is a presentation of MGM Television, Talpa Media USA Inc. and Warner Horizon Unscripted & Alternative Television. The series was created by John de Mol, who serves as executive producer along with Mark Burnett, Audrey Morrissey, Amanda Zucker, Kyra Thompson and Stijn Bakkers. · “The Voice” ranks this season as television’s #1 alternative series, with the Monday edition averaging a 2.1 rating in adults 18-49 and 10.7 million viewers overall in “live plus seven day” averages from Nielsen Media Research. Through the season’s opening 12 weeks, the Monday edition of “The Voice” is undefeated in its timeslot versus regular broadcast competition in the key 18-49 demographic. · The third season of NBC’s hit dance competition series is led by a judging team of extraordinary dance superstars – Jennifer Lopez, Derek Hough, NE-YO and host Scott Evans. The series will give dancers the platform to showcase their talents and the opportunity to receive a life-altering grand prize of $1 million. · Jennifer Lopez, Elaine Goldsmith-Thomas & Benny Medina executive produce for Nuyorican Productions. Executive producers also include Kris Curry, Matilda Zoltowski, Tina Nictoera Bachmann, Alex Rudzinski, David Gonzalez and Matthew Everitt. The series is produced by Universal Television Alternative Studio in association with Nuyorican Productions and World of Dance. · In its second season through summer 2018, “World of Dance” averaged a 1.7 rating in adults 18-49 and 7.2 viewers overall in “live plus seven day” Nielsens. Season 2 of “World of Dance” won its timeslot 15 of 16 times versus regular competition on the Big 4 networks in “live plus same day” adult 18-49 ratings. “World of Dance” generated a strong family audience, ranking as the #4 summer series on the Big 4 networks in kids 2-11. · Season two is all about women dealing with the consequences of their criminal behavior. What happens in the wake of the trigger being pulled will have life-changing consequences that ripple through the entire season for Beth, Ruby and Annie. · The cast includes Christina Hendricks, Retta, Mae Whitman, Reno Wilson, Manny Montana, Lidya Jewett, Isaiah Stannard and Matthew Lillard. 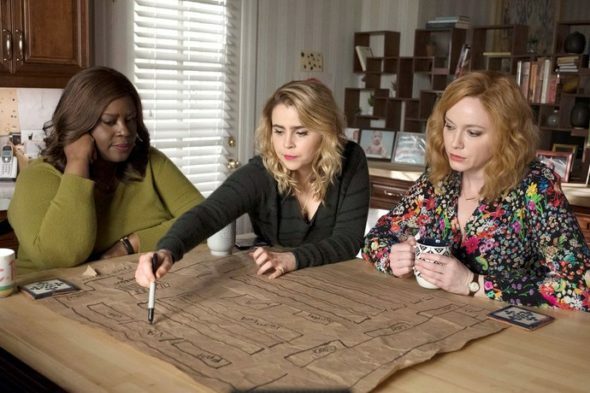 · In its first season “Good Girls” averaged a 1.5 rating in adults 18-49 and 6.1 million viewers overall in “live plus seven day” ratings from Nielsen Media Research, to improve the time period by +15% versus NBC’s year-earlier results in 18-49. When viewership on linear and non-linear platforms up to 35 days was added, the “Good Girls” season average in 18-49 increased to a 2.2 rating in 18-49. “Good Girls” went undefeated in the timeslot in 18-49 versus CBS’ competing drama “Scorpion” and ABC’s competing rookie drama “The Crossing” (“live plus same day”). · Jenna Bans writes and executive produces. Michael Weaver directs and executive produces. Jeannine Renshaw, Mark Wielding and Bill Krebs also executive produce. “Good Girls” is produced by Universal Television. · After losing out on a chance to get out of Toledo and into his dream job at a prestigious university in Season 1, disgraced Harvard philosophy professor Jack Griffin (Glenn Howerton) remains determined to get out of town and regain prominence in the academic world. To do this, Jack decides to begin work on a book detailing a new philosophical thesis. This thesis will require him to immerse himself in Toledo more than ever before while continuing to enlist the help of his students and friends at Whitlock – including Principal Durbin (Patton Oswalt). Jack will also find himself intellectually challenged and charmed by a woman he meets in the last place he’d expect: the payroll department of Whitlock High. · The cast also includes Lyric Lewis, Mary Sohn, Jean Villepique and Paula Pell. · “A.P. Bio” is written and executive produced by Mike O’Brien. Seth Meyers, Mike Shoemaker, Andrew Singer and Lorne Michaels also serve as executive producers. “A.P. Bio” is produced by Universal Television, Broadway Video and Sethmaker Shoemeyers Productions. · “A.P. Bio” retained 100% of NBC’s year-earlier results in the timeslot in adults 18-49 (1.0 vs. 1.0, L+7 versus regular original entertainment programming) and grew by +5% in total viewers (3.123 million vs. 2.985 million). “A.P. Bio” generated one of the most highly educated audiences among Big 4 primetime shows last season, indexing at a 148 among adults 18-49 with four or more years of college to tie for #4 among primetime series on the Big 4 networks. What do you think? Are you looking forward to the returns of any or all of these NBC shows? More about: AP Bio, AP Bio: canceled or renewed?, Good Girls, Good Girls: canceled or renewed?, NBC TV shows: canceled or renewed?, The Voice, The Voice: canceled or renewed?, World of Dance, World of Dance: canceled or renewed? I LOVE A.P. Bio! I know it’s probably a love it or hate it kind of show. I just get it. It’s my kind of comedy. I just knew it would be a matter of time before “The Voice” got cut back to one night per week. “American Idol” also cut back on its results show in its later years, and “Dancing with the Stars” got itself trimmed to airing only on Mondays after having its results show on Tuesdays. Those results shows really are a waste of scheduling for any network. nope all these show are boring but they had nerves to cancel the taken which was a 100% more interesting .exciting ..good action ..